NAGA CITY (Bicol Standard) – A fundraising concert for the benefit of the Philippine Red Cross Camarines Sur Chapter is slated on February 8, 2019 at The Tent, Avenue Plaza Hotel, Magsaysay Avenue, this city. The concert dubbed “Soundwaves Goes Nutz” features homegrown showband Soundwaves, along with special guests Mixed Nutz, Fr. Don Federico, Fr. Francis Tordilla, and Brendalyn Arroyo. Ningning David-Belmonte, of Soundwaves, said that they will perform songs from the 70s, 80s, and 90s to cater to a wide audience. “As artists, we want to use our talents to help the Philippine Red Cross, which has been unrelenting in its service to the community,” David-Belmonte added during the press conference at The Boardroom, Avenue Plaza Hotel this morning. “Singing is really our passion. We enjoy seeing people enjoy our music, with the added benefit of helping the Red Cross,” she further stated. 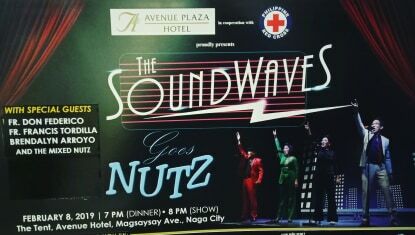 Soundwaves is among the more popular local bands which perform not only locally but also abroad. Tickets for the two-hour dinner concert cost P2,000, P1,400, and P1,000. The venue can accommodate around 700 guests. Meantime, Maria Theresa S. Bongiad, Officer-in-Charge of the Philippine Red Cross Camarines Sur Chapter said the concert is just one of the projects of the organization. During the recent tropical depressions Usman and Amang, the Red Cross extended support in terms of relief goods and psychosocial services to the victims in the province. “We aim to raise awareness through this concert about our initiatives, and encourage other people to help out,” Bongiad explained.